There were so many events which moved me in 2008. 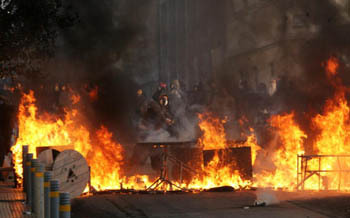 But one which I think is most emblematic of what might come in 2009 are the popular and violent uprisings in Greece. And the place, Athens, says much about the ailing state of our democracies. It’s hard to overlook the paradox. Greece, "the cradle of democracy" is now ablaze and the political system fathered by Plato and Aristotle lies in ruins, amid the smolderering debris, scattered throughout the streets of the ancient city. Riots sparked by the police shooting of a male teenager, Alexandros Grigoropoulos, 15, earlier this month, have continued almost unabated to this day. And like avenging furies the youths’ rage seems insatiable. As Athens burns, the EU looks on aghast and mute. Last year the country faced another tragedy: it was engulfed in wild fires and on the verge of ecological disaster. This year it’s consumed in an urban conflagration, which threatens to topple the centre right government led by Kostas Karamanlis, and along with it, perhaps bring down the decrepit pillars on which Greek democracy rests upon. But Greece like many "post democratic" ( by this I mean, states where legitimate representative government has been usurped by a ruling clique which only represents corporate and military interests at the expense of the general electorate) societies is really a timocracy (1). So, not surprisingly the "600 Euro generation" which symbolises their pitiful monthly earnings, are tired of the unbridled greed and nepotism from above, and have taken to streets to express their ire with the whole rotten system. But also, the rage is due apparently, to the current global financial crisis and growing unemployment in Europe. These 20s something university graduates (for the most part) are fed up with poor job prospects and a rising cost of living. Lunging Molotov cocktails at riot police is one way (although not very conciliatory) to make your vote count and your voice heard so to speak perhaps. But as tear gas and the smoke recedes for now, the question needs to be posed: Are our so called "liberal democracies" withering away? They might be. The danger is that after years of too much freedom and permissiveness which we enjoyed after the fall of the Berlin wall, the people, the policians and above all the Wall Street financiers with their gambling games, have become "drunk" with freedom to the point of recklessness. This undermines democracy. Plato argued in "The Republic" that this less than ideal polity may be replaced with despotism, to preserve the powerful ruling class. Indeed, my greatest fear is that the tyranny of the marketplace, we have witnessed until now, in the wake of the financial meltdown, might result in just tyranny taking over. And with the ideological bankruptcy of western style free market capitalism, accompanied by shortages, increased crime, and street protests, governments may have no option but to resort to strong-arm tactics (emergency powers, curfews, arbitrary arrests etc) to keep their people in line and avoid another Athens style uprising at home. While Athens is ablaze, European capitals watch in sinister silence, as the urban warfare drags on. Foremost, on the minds of governing elites elsewhere might be, the dreaded thought: "could this happen here, too?" The answer might be: don’t be surprised if it does. The rage and exasperation was best expressed by Panos Garganas, an urbane leftist, who thinks the civil unrest in his country may spread to other European states. The economic crisis is huge and Greece is showing, I think, the future for what will happen in other countrie s" he told the BBC in a recent interview. Greece has imploded. This is mainly due to the neo liberal policies. These measures euphemistically called "structural adjustments" or known more ominously as IMF –EU- World Bank sponsored and orchestrated "reforms"; meaning price deregulation and the elimination of subsidies, state spending cuts on health and education, privatisations en masse and limiting pension benefits. All of these have taken their toll on the Greeks. So who’s next? What is most astonishing to me is this: In an EU member state , a 19th century like class struggle has emerged as a result of this unrest, which recalls the bloody revolts of 1848 in the German states or the brief worker’s takeover of the French capital known as the ‘Paris commune’ of 1871. Is 2009 going to be like 1989? Almost 20 years ago, the oppressive communist regimes collapsed with the fall of the Berlin wall. In the 1990s, Democracy seemed to be at its apogee back then. It spread all over the globe. Of course Freedom came at a price: it was accompanied by free market principles or the dogma that the markets are absolute rulers over our little and expendable lives and only the stock markets can determine our destiny, or foster the well being of the society at large. In Russia, greater personal liberties also meant huge sell offs of under priced state assets, such as natural resources, to "robber barons". But then as well, South African apartheid was finally dismantled in 1994, and much of Africa and Asia saw military regimes replaced by civilian rule. However with the Bush presidency, we saw great setbacks in democracy on both the home and foreign front; illegal foreign occupations, state sponsored torture was justified, systematic surveillance on the ordinary citizen, extra judicial and territorial penal colonies were set up and so on. Furthermore, the war in Iraq although it was supposed to overthrow a tyrant ( and thankfully it did) yet ironically, it also saw, other despotic regimes, like Egypt, Syria, Saudi Arabia, and above all Iran tighten their grip on power by crushing local dissent. In 2008, multi billion dollar, massive bank bail outs were almost decreed by the Bush administration, and railroaded through Congress, as if hey were royal edicts. Americans whether they liked it or not, have indebted themselves for generations to come. Established European democracies stumbled too. In the streets of Rome, martial law light was declared when troops were deployed to keep order and to intimidate illegal immigrants. In the U.S’ neighbour, Canada, parliament was effectively shut down (and so was the democratic process) or prorogued by the Prime Minister, Stephan Harper. In Mexico, the military has been given extraordinary powers to fight the incessant drug war at the expense of human rights. But let’s get back to Greece, where Democracy began. It may falter further, if the Greek government resorts to martial law to quell the revolts. Or it may be reborn, in a revolutionary form and preferably in a peaceful manner, if the will of the people prevails over oppressive outcomes. In that sense, 2009 might be like 1989: a year of democratic renewal. Or in the worst case scenario, events in the New Year can take us back to a darker period in time, like in 1939 and another world war. It is up to the free spirited citizens left among us, to decide the future course of events. (1) In Plato’s "The Republic", Socrates defines a timocracy as a government ruled by people who love honor and are selected according to the degree of honor they hold in society. Honor is often equated with wealth and possession so this kind of gilded government leads to the people valuing materialism above all things.